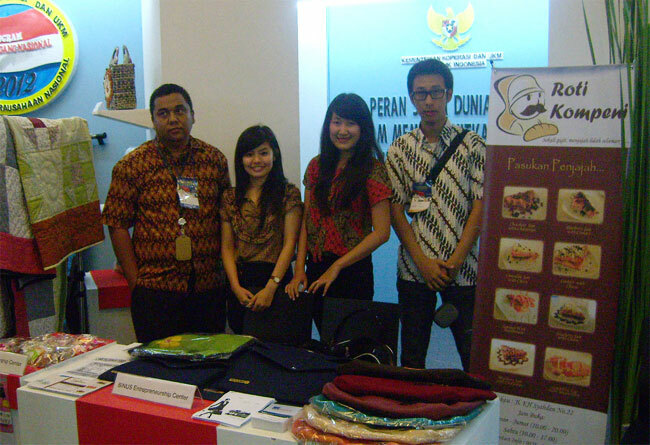 Students of BINUS UNIVERSITY participated in the National Entrepreneurship Movement 2012, in Smesco Building, South Jakarta, March 8-11, 2012. They displayed their work, which represent their early steps in entrepreneurship. Forenzi (Danny), Flannel World (Novi), JinSu Art (Angela Merici), Bueno Creed (Shierly dan Ivon), Omni Jeans (Febrina) and Roti Kompeni (Bima, Tiara, Bowo, Alvin, Bopi) were the participants of this event. Their work is inspired by creativity, experience, the ability to see opportunities, and guidance from Binus Entrepreneurship Center (BEC) which fully supports the students’ entrepreneurship efforts. “With Entrepreneurship Study, all students in BINUS University are urged to create new businesses which suits their interests,” explained BINUS Entrepreneurship Center (BEC) Manager Karyana Hutomo, ST, MM. The booth of BINUS UNIVERSITY students joined with the booth of The Cooperatives and Small and Medium Enterprises Ministry (KUKM) were also visited by KUKM Minister, Syarif Hasan, SE, MM MBA. Program Development Head BEC, Rido Sarwono,ST. MT., had the opportunity to shook hands with the minister. When he chatted with BINUSIAN, the minister expressed his interest on the spirit and creativity of young entrepreneurs which begins from the campus. He hoped young entrepreneurs will be able to improve their current efforts to create independence and enhance the nation’s economy. For further information, the event which was initiated by Cooperatives and Small and Medium Enterprises Ministry was officially opened by the President Susilo Bambang Yudhoyono on March 8, 2012.